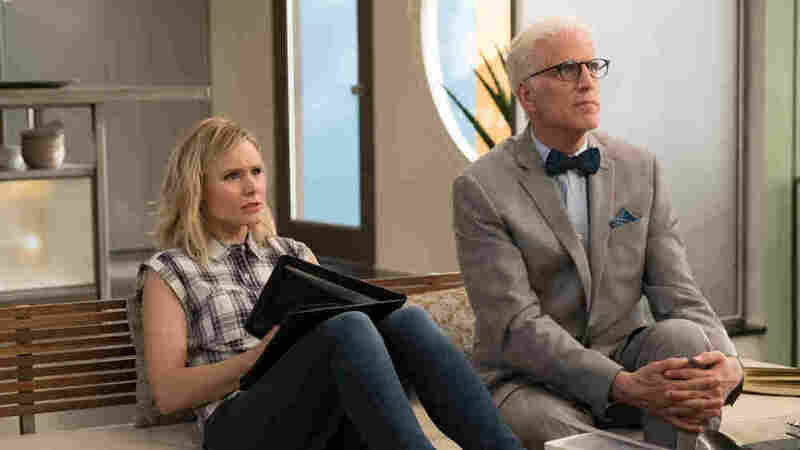 Pop Culture Happy Hour: 'The Good Place' The podcast's producer emeritus, Mike Katzif, joins the panel to talk about the NBC comedy The Good Place, which is about the afterlife, becoming a better person, and figuring out what's going on. Kristen Bell as Eleanor and Ted Danson as Michael in The Good Place. NBC's The Good Place is an unconventional comedy. It begins with death — with Eleanor (Kristen Bell) waking up and being informed by Michael (Ted Danson) that she's in heaven — The Good Place. Eleanor knows she doesn't belong there; she's surrounded by people who seem to be much better than she is. What now? The show recently started its second season, and while we talk about how it works structurally (it featured a significant reset at the beginning of the season), we try to preserve its best surprises as we sit down with Mike Katzif, our producer emeritus and music director, to talk about the show, the wonderful cast, the mischievous and often silly writing, and how well we've gotten to know the characters in only a little more than a season.